Do I think about God? I want to have a healthy fear of who God is, alongside a confidence in His love for me. Jesus, I want to know You, that I may think of you rightly. Do you think about God? How so? I’m a little late commenting here, but I’m just now catching up on my Google Reader, so it’s all good. 🙂 In his book, The Knowledge of the Holy, Tozer discusses this question in depth, and I loved that book, so I had to give my thoughts. Tozer goes on to say, “Without doubt, the mightiest thought the mind can entertain is the thought of God, and the weightiest word in any language is its word for God.” Wow! And I throw the name of God around just like any other word in our language. Christians should constantly be entertaining thoughts about God. So often we get caught up in thoughts about what we should do or where we should be in our faith, but this takes our focus off the Trinity and instead puts the focus on us. This is dangerous as it tends to lessen our view of God. We put Him on our level instead of elevating our concept of God until it is one worthy of Him. Psalm 50 and the last few chapters of Job clearly illustrate that God doesn’t need us. 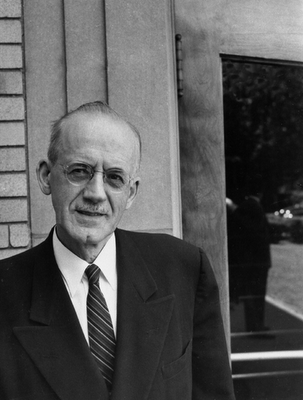 As Tozer himself put it, “He is not greater for our being, nor would He be less if we did not exist.” Even though He doesn’t need us, He still thinks about us, yet I think about Him so little in comparison. He is so much bigger than anything I can put into words and His attributes are numberless, so my thoughts about Him could last a life time. Everything around us can spur thoughts about God if only we were to pay attention. As Rita Springer sings in the song “About God,” How can we walk underneath an open sky? How can we say we have eyes and yet we can be so blind? You have your race and religion, and I guess I have mine, But what about God?” Everything should be about God! Think of how much better worshippers we would be if we truly knew who we were worshipping. Good post, Bryce, thanks for encouraging me to think about God.